Happy Brooklyn Book Festival! Yesterday felt like something of a holiday in my insulated literary world. 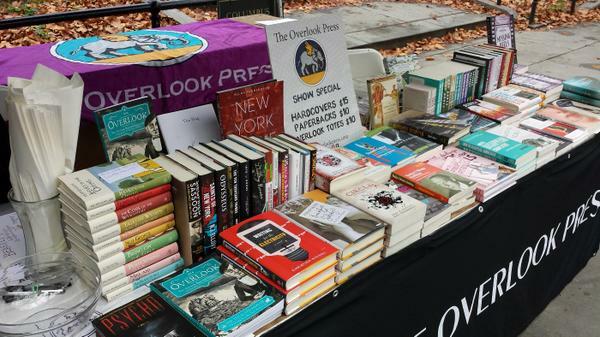 For the second year in a row, I attended the Brooklyn Book Festival. Last year, I came to the event wide-eyed and newly living in Brooklyn. It was an overwhelming introduction that nonetheless left me excited for this literary path I’ve wandered down. One year later, I returned under much different circumstances. Whereas last year, I aimlessly strolled through the exhibitors’ sections, wondering if I should approach booths full of strangers, likely interns, and chat them up about their journal/press/literary organization, this year I was decidedly stationary. I spent the afternoon representing my publishing house, The Overlook Press. At last year’s Brooklyn Book Festival, I stalked a publisher and practically spewed praise on her. I dripped with newness and uncertainty. This year, I skipped most of the panels (and didn’t line up in time to make it into “A Woman’s Work,” which featured the currently ubiquitous literary darling Roxanne Gay and other females writers talking about being female writers). Last year the festival was about getting out there, mixing with Brooklyn’s literary elite, and fulfilling that necessary evil of job hunting, networking. This year, I was able to sit back and relax a bit. I had a place to be, something to represent. I was an exhibitor at the festival, a part of the whole. In addition to the festival, I had something even better to look forward to after it: I was a reader at theNewerYork‘s Fifth Annual Literary Madhouse. This marked my second reading in NYC, this time in Manhattan’s amazing venue Le Poisson Rouge. The reading went swimmingly: I bonded with fellow writers, made the audience laugh, and learned that my piece will be included in theNewerYork’s next print anthology. Sunday was a busy day for me, much fuller than my usual Sunday of going to the farmers’ market, writing, and staying up late with my roommate to put off Monday morning a little longer. With fall here, Sunday felt like the perfect feather in the cap of summer, a busy day spent mostly outside, grasping onto the last traces of warm weather, mingling with other writers before the cold sets in and we settle into our own hibernations, opting to stay in and write our way through the darker seasons until next spring when we emerge from our dens and find new ways to celebrate having survived another winter. It does, and you should mark your calendar now for next year’s event! It’s the best opportunity to see the Brooklyn literary scene come together.